The core “Original” flavor is super clean and much smoother than the prior version. Losing the citric acid, which makes this a single ingredient product, is likely the key. We love the mild birch flavor to it, and we also love the fact that this product has only 25 calories and 6 g of sugar per bottle. They’ve done a really nice job preserving the integrity and purity of the birch sap, which is really all we can ask for from a product like this. The other two flavors, which include Apple Ginger with Chaga and Strawberry Lavender with Chaga, take a slightly more adventurous approach. The birch sap provides the base for the drink, which allows it to avoid using water while also adding a subtle earthy flavor (which might be aided by the addition of chaga extract). From there, additional ingredients are added, although they are clearly in light doses since these products are still relatively low in calories (50 for Apple Ginger and 40 for Strawberry Lavender). Both products taste good, although we probably prefer the sweet and spicy flavor profile of Apple Ginger to the more mellow and floral flavor of the Strawberry Lavender. 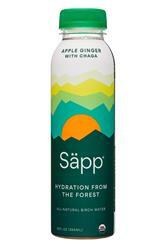 On the packaging front, Säpp’s fully wrapped 12 oz plastic bottle is much more attractive than the uniquely shaped glass bottle used in its previous version. 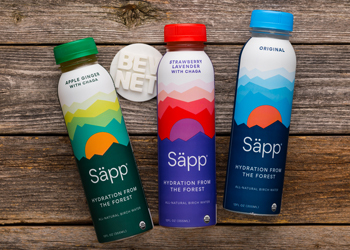 The colorful design definitely catches the eye and using “hydration from the forest” as the hero feels better than making the focus on birch water (which now gets second billing). Plus they've done a nice job of arranging the front panel text in a way that’s easy to read and intuitive. 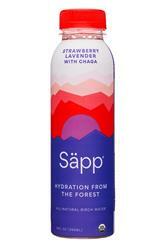 In the end, this update from Säpp feels like something that will help both the company and the tree water category in general. The segway from being an ingredient play into a healthy/functional beverage that’s powered by the forest feels like something that is both on-trend and appealing to a broader audience than the original.